Les Madieres is a century-old restored stone farmhouse set in an acre and a half of lush land and gardens. A peaceful retreat in the French countryside, minutes from the bustling market town of Vire, with easy access to many attractions of Normandy. There are 3 comfortable bedrooms and 2 bathrooms, including a spa-like bathroom downstairs. Downstairs: kitchen, dining room, & lounge with wood-beamed ceiling & granite fireplace. The lounge features a TV, sky digibox, dvd player, games & books. An excellent supply of pots & pans, to practice your French cuisine awaits! Situated on an over an acre, Les Madieres invites you to enjoy some wine on the terrace, stroll the apple orchard, or relax on a tree-shaded lounge chair & lose yourself in a book. Children will love playing on the vast fenced lawn, or searching for of our resident frog in the pond. Ignite the barbecue & enjoy alfresco dining. The setting is tranquil, surrounded by farmland including our neighbouring cows. ** some recent upgrades to Les Madieres include removing the old canvas gazebo and replacing with a permanent wooden pergola that covers more of the terrace, a great place to enjoy a bottle of wine. We have also purchased a large kitchen table and chair set for dining and replaced our old tv with a new 32” LCD TV for the lounge. Our gardeners have been hard at work taming the garden (Normandy see loads of growth in the spring!) so you may see some work being done as we expand our terrace area and open it up further to the garden. Hi, we're Ken and Kimberley Foster. We are Canadians who love Europe and old world charm: the food, architecture, history, and of course, wine! We have two little boys who enjoy exploring the farm in France and tasting new foods and ancient ruins. We bought the house to create a life a bit less ordinary from our lives in Vancouver - best decision we ever made. Location, location, location. A stone farmhouse on nearly 2 acres of tranquil farmland. The boys can safely roam the property. It has an orchard that locals harvest the apples and pears from to make wine. It is a quick trip into a great market town, which has a direct train to Paris! Spa like bathroom downstairs with separate water-closet. Upstairs there is a second water closet. The house contains 3 comfortable bedrooms (sleeps 6), and 2 bathrooms, including a spa-like bathroom downstairs. The rooms downstairs include a kitchen, dining room, and lounge complete with wood-beamed ceilings and a granite fireplace. The lounge is equipped with a tv, sky digibox, dvd player, games and books. You’ll find an excellent supply of pots and pans, baking dishes, etc, to practice your French cuisine! A utility room off the entrance hall contains a washing machine, iron, etc. We had a wonderful time at Les Desert as well. The house itself was perfect size for 4 adults and 2 children (as long as the adults are willing to sleep two to a bed). The gardens were fantastic and we had some epic games of badminton over the laundry hanging line. FYI, there is no wireless internet in the house, but you will not need it. We easily made day trips to Festyland for the kids, Omaha Beach and Mont St. Michel. The town of Vire (15 minutes drive) was also a great place to sightsee in the area. Ken was very quick to respond to us as well. Thanks for a great vacation spot for our family! We enjoyed a fantastic week at this lovely house at the end of April. The house and gardens were delightful - plenty of space and our boys really enjoyed the garden. One of them managed to fall into the pond fully dressed! Unfortunately the terrace was overgrown with weeds and no garden furniture, so we were unable to enjoy the terrace on the warmer days. The house is very comfortable and cosy. The house is in a great location - so much to see and do in every direction - we would love to go for another visit. Thanks for the review, much appreciated. Sorry to hear about overgrowth on terrace. Spring in Normandy can produce rapid growth - we've got our gardener on it! We would love to have you back - all returning guests enjoy a 10% discount. Cheers, Ken & Kimberley. Les Madieres - website dosn't do it justice. We'd read other people's reviews about the photos - but believe us its true. Wether you're a seasoned Gitte-er or have never had a French Cottage holiday before you will not regret staying at this beautiful property in fantastic surroundings, everything in the advert is accurate and the house was spotless and well decorated and furnished. The owner Ken may be in Vancouver but answers emails almost imediatly and when we were there, the local property manager was a very helpful english girl who lived nearby. We live on the outskirts of London and really appreciated the fact that it got dark at night (enough to see meteor showers) and during the day all you can hear is birds and the odd donkey or cow. 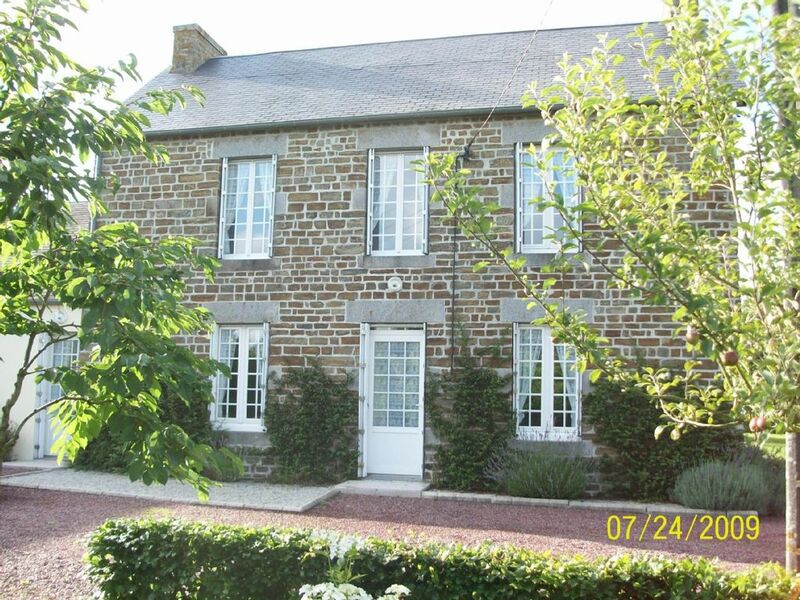 The nearest Town is Vire -15 mins away by car with a great market on fridays,also with the Carrefour etc. If History's your thing amazingly this area was a major turning point in WW2 after D Day there are several museums,memorials & cemetaries in the area, and not far is Bayeux (tapestry) and Caen (Home of William the Conqueror -although he wasn't called that pre -1066). We are in our 50's and had a wonderful holiday here with our 15 year old son, even he looked up from his phone and nintendo occasionally!. Theres also plenty in the area to paint if you're in to art or youcan just enjoy the grounds, with your bread,wine and cheese for lunch by the pond or BBQ for dinner. We will definitely be returning, as soon as we can. Hidden Treasure in Calvados ! The charm, elegance and setting of this country farmhouse is an experience that everyone will enjoy. Nestled in the countryside, it is quiet & peaceful, and yet only a 10 minute drive to Vire, and 40 mins to Caen. While relaxing in the garden I heard grasshoppers busy in the long grass - something that I haven't heard with a few years! A wonderful kitchen of goodies awaits the 'gourmet-inclined' traveller with various utensils & pots available, plus the benefit of a herb garden outside, plus apple and pear trees. The cleanliness of the house was fresh & crisp. A welcome note from the owners awaited us with some freshly cut roses and wine in the living room. It's the perfect location for visiting the many tourist sights in Normandy and we even managed a day trip to Paris by train from Vire. The house is a 'treasure' that you dream about finding and are overwhelmed when you actually arrive there in person. We had a super time and hope to return again soon - Marguerita, Ireland. We had a lovely time at your house in Les Desert. It had everything we needed and was very comfortable for our short stay. The beds are lovely and comfortable and it was great to have fresh linen and towels provided. The house was nice and warm when we arrived and the wine and milk left for us were a lovely welcome. Overall, the house provided for all our needs and exceeded our expectations from the photographs. Perhaps you could include more photos on your website so people can fully appreciate the size of the rooms and the quality of the furnishings (a picture of the dining room and/or shower in the bathroom for example). The garden and surroundings are also very peaceful and I imagine would be lovely in warmer weather. Les Madieres is a 15 min. drive to Vire, a busy town with shopping, bakeries, cafes, cinema, water park & restaurants. Calvados features gorgeous towns, breathtaking scenery, medieval villages & castles. Families will love Festyland amusement park, Festival International de Cerf-Volant (Kite Festival!) at Dieppe, La Cite de la Mer Aquarium in Cherbourg, the Zoo de Jurques, Chateau de Vendeuvre with mechanical figures, fountains & mazes. Gourmets indulge in French cheeses like Camembert, butter, rich creams, & everything apple, including the famous apple cider routes of Pays d’Auge. Superb golf: excellent courses, reasonable prices, open tee times. 25% deposit is required to secure booking. Payment is to be received 30 days prior to rental. Note: there is NO additional charge for towels, linens or cleaning.